and to bloom in your favorite color. Pale blue is my favorite color for hydrangea blooms, but I love all hydrangeas in whatever colors they bloom. Nonetheless, I follow in my mother's footsteps and try to get my hydrangeas to bloom the beautiful shade of blue like this one that came from her yard. French hydrangeas, mopheads, Annabelle, oakleaf, PeeGee, and lacecap are well-known hydrangea varieties, but not all hydrangeas have the same requirements for blooms, have the same seasonal period for blooms, nor have the ability to change their bloom colors. 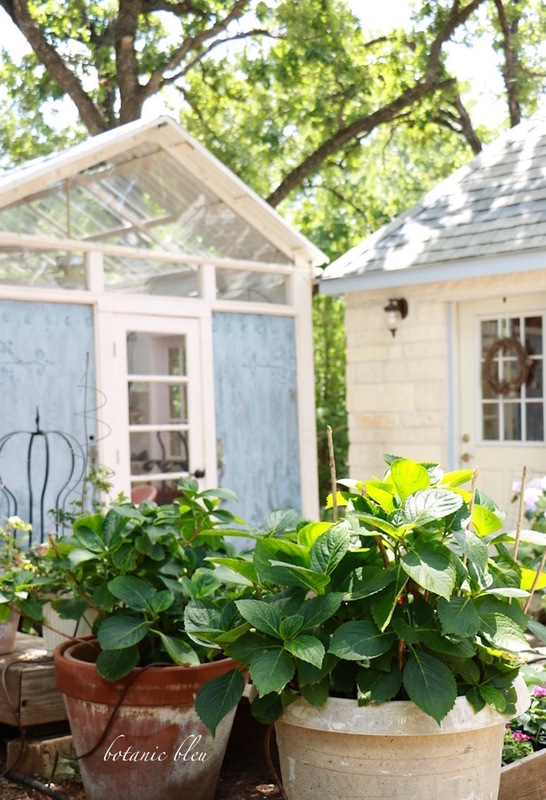 Veteran gardeners know how important location is for the success of all plants, and they know that a good location in Huntsville, Alabama is not a good location in Fort Worth, Texas. In Alabama, hydrangeas do well in a spot with morning sun and afternoon shade. In my north Texas yard, hydrangeas do well in dappled shady spots with filtered sunlight for the entire day. Too much direct sunlight burns the plants. Planting hydrangeas in large pots will allow you to move the plant around your garden until you find the best location for the plant. These hydrangeas are transplants from my mother's yard in Alabama and are sitting in my yard in Texas. The hydrangeas are on the north side of the garden house and receive a little direct morning sunlight until around noon when this photo was taken. Rule of thumb for how much sun is the farther north you are, the more morning sunlight, up to full morning sunlight; the farther south you are the more dappled shade and fewer hours of full sun. One reason hydrangeas fail to bloom is too little sunlight. The plants can look healthy with lush leaves, but without enough sunlight the plants will not bloom. The key is providing the right balance between sun and shade. All hydrangeas prefer loamy soil that includes rich humus, composted organic matter. If your soil is sandy, add peat moss to retain moisture. If your soil is heavy clay, add gypsum to loosen the clay for good drainage and air circulation around the roots. Add 2"-6" of composted organic matter across the entire growing area for all soil types. 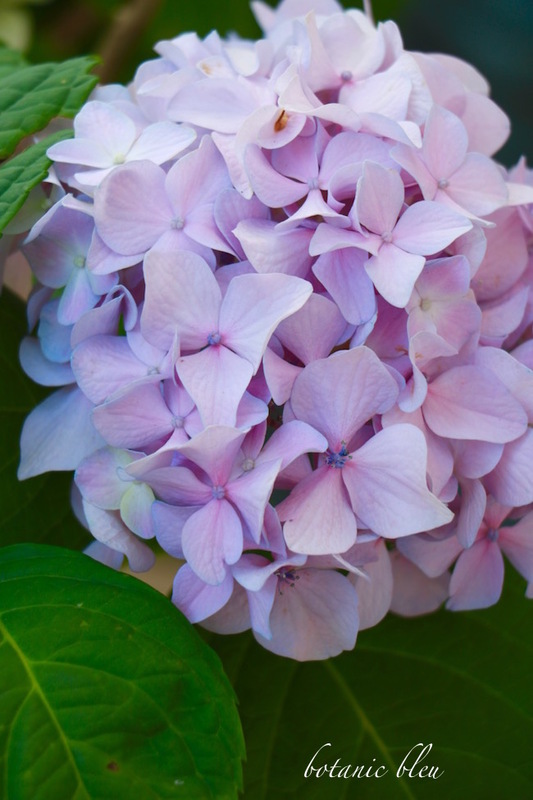 Some hydrangeas' bloom colors depend upon the pH level of the soil. There are 14 levels of pH. 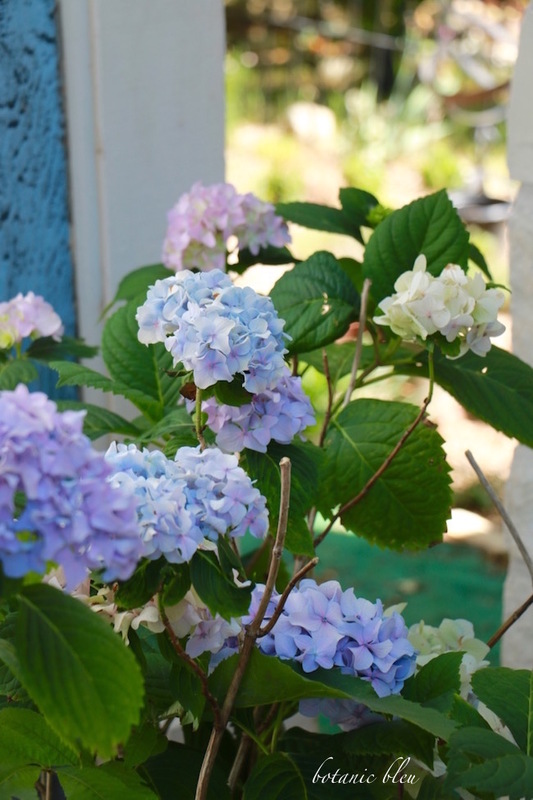 When the soil's pH balance is close to neutral, 5.5-6.0 pH, blooms on a hydrangea plant can be several colors, pink, lavender, blue, white, on the same plant or even on the same bloom. There are several categories for hydrangeas. Hydrangea macrophylla (Mophead, Lacecap, and Bigleaf) is the variety for which soil pH determines the color of the blooms. 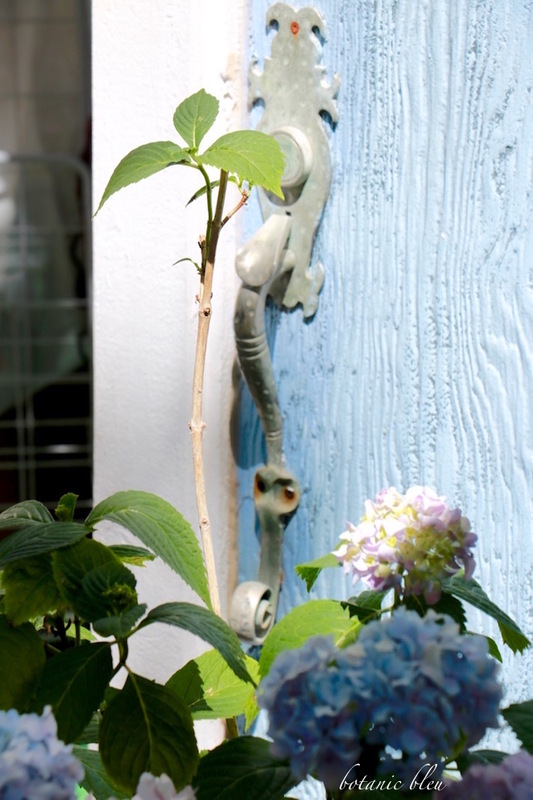 Here's how you get those gorgeous hydrangea blooms in the color you love! Pink, blue, lavender, or multi-colored on the same bush. 🌿 Acidic soil with a pH of 5.2-5.5 produces blue flowers. Add aluminum sulfate to the soil during the winter or very early spring to change the soil's pH. 🌿 Alkaline soil with a pH of 6.0-6.2 produces pink flowers. Add garden lime to the soil during the winter or very early spring to raise the alkaline level of the soil. 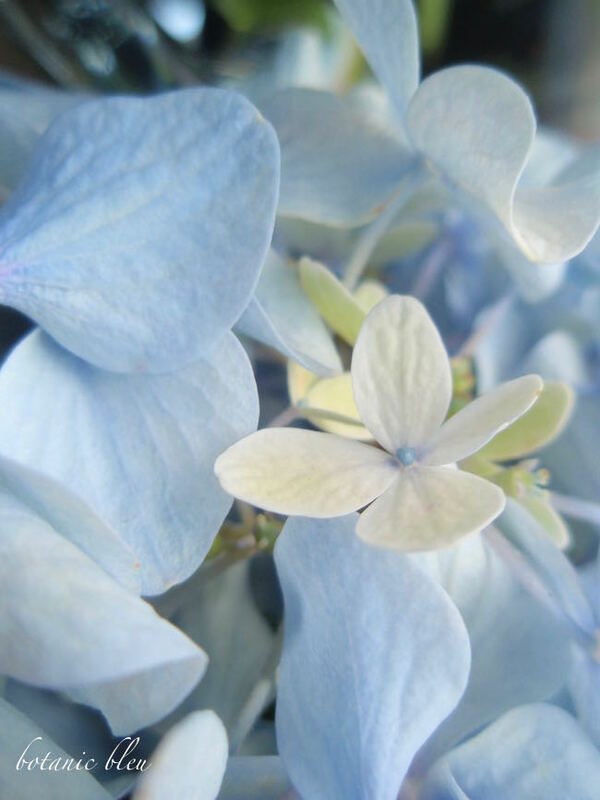 🌿 Adjusting soil pH is an ongoing process each year to maintain the correct pH level for the desired color of flowers on hydrangea macrophylla plants. Several applications may be needed during the growing season and each subsequent year. 🌿 Dilute minerals with plenty of water and apply sparingly to prevent damaging the plant. 🌿 Neutral soil with a pH of 5.5-6.0 produces lavender flowers. 🌿 Soil with mixed pH produces multiple flower colors on the same plant. To avoid multi-colors, apply minerals UNIFORMLY and PERIODICALLY in the growing area of the plant's roots. 🌿 White hydrangea flowers (Annabelle, Oakleaf, and PeeGee) are not affected by changes in the soil pH. 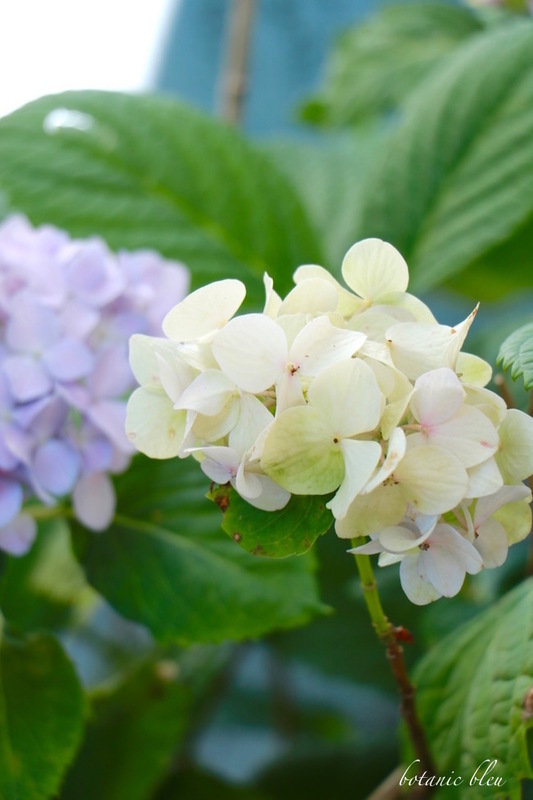 Lack of vital minerals or too much of a mineral affects how hydrangeas bloom... or don't bloom. If your plants bloomed in the past, apply a fertilizer with a high middle number (phosphorus) in the spring for continued success in blooming. 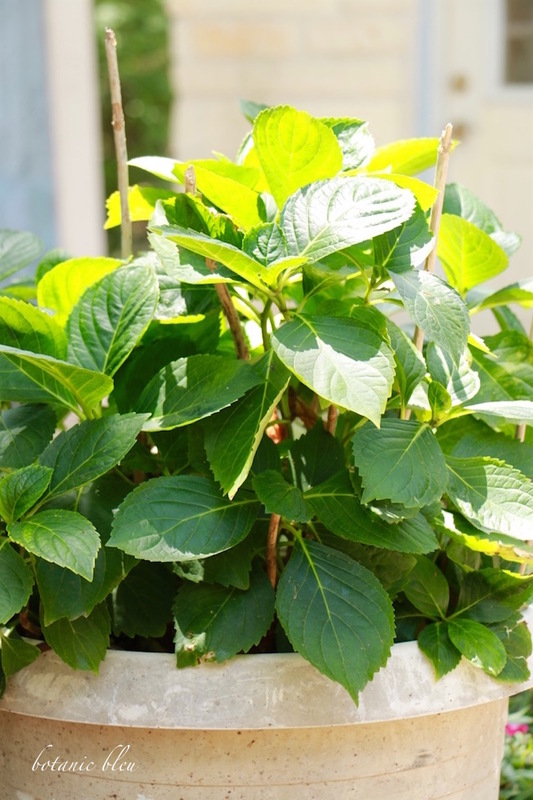 If your pampered hydrangea plant is in the perfect sun/shade spot and receives uniform moisture, but is full of lush dark green leaves only and NO blooms, fertilizer or no fertilizer may be the culprit. Over fertilizing can cause big, leafy dark foliage and no blooms. More is not always better. Follow the package's directions for how much and how often. When to prune depends upon the kind of hydrangea. The green sprout on the stem shown grew on OLD WOOD. 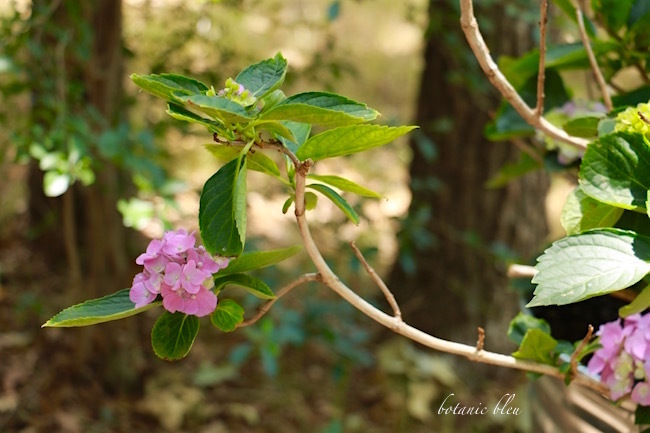 Some hydrangeas produce blooms on old wood and others produce blooms on new wood. Prune at the wrong time and ... NO BLOOMS. Be slow to cut back what you think is dead wood on hydrangea macrophylla hydrangeas. 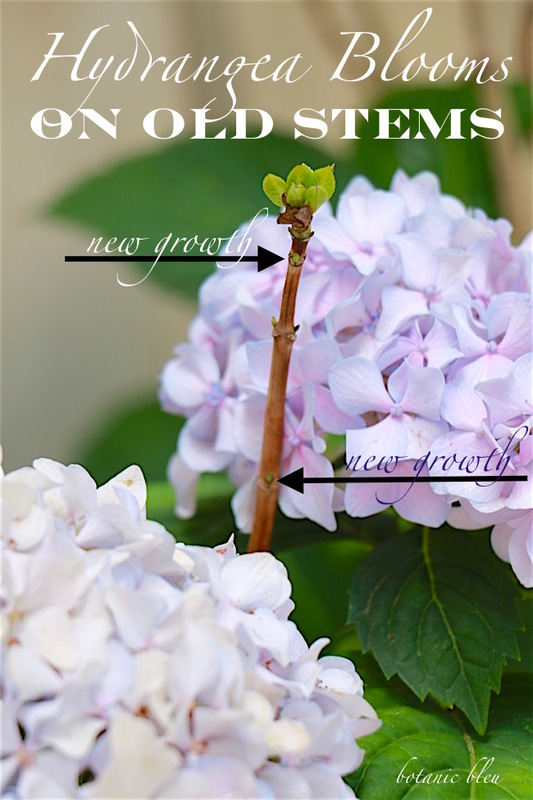 Sometimes new growth on old stems will appear after the plant has already begun blooming. These blooms grew on the ends of last year's stems. If you prune what you think is dead wood too early in the spring, you may really be pruning live stems with some of this year's blooms. Hydrangea macrophylla (Mophead, Lacecap, and Bigleaf) and Hydrangea quercifolia (Oakleaf) hydrangeas bloom on old wood. Prune these plants after they bloom, but before August 1 each summer. Next year's buds grow on this year's branches. If the plant is pruned late or frozen back to the ground during a hard winter, there will not be any blooms in the next year. Be sure to protect hydrangeas in late spring from late frosts by covering the entire plant. Hydrangea paniculates and Hydrangea arborscens (Annabelle) hydrangeas bloom on new wood that sprouts during the current growing season. Prune in the early fall or winter. 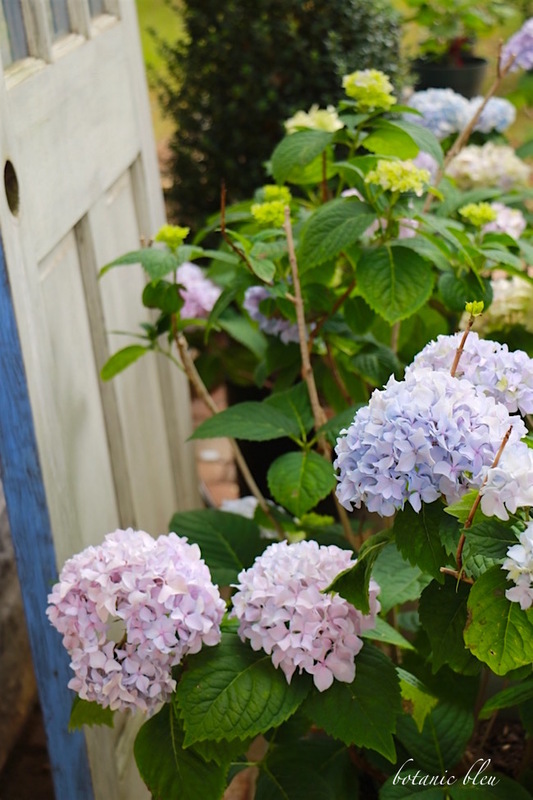 Hydrangea macrophylla (Endless Summer) is one of the new varieties that blooms on both old and new wood. Prune late spring, summer, or fall. 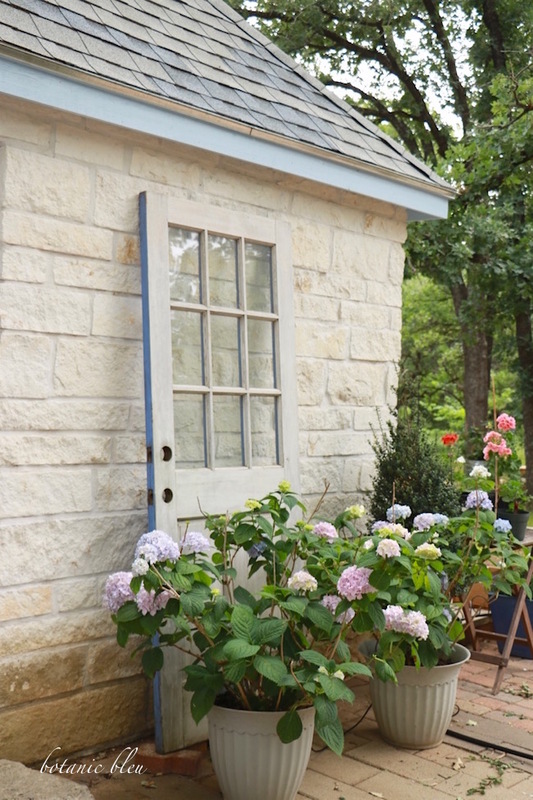 Surprisingly, overwatering can produce fewer blooms on hydrangeas. Hydrangeas like moist soil, but not wet conditions. Good drainage helps prevent water logging plants. If planted in pots, add rocks to the bottom of the pot, and use pots with drainage holes. Irrigation systems, especially soaker hoses and drip systems, offer consistent watering needed for healthy blooming plants. Here in Texas we have high temperatures that cause the plants to wilt. Watering in early morning helps, but does not always eliminate wilted hydrangeas. Adding a thick layer of mulch conserves water, helps keep the ground cooler, and controls weeds. For more information about hydrangeas, you may enjoy the following. Endless Summer Blooms offers excellent tips for soil preparation including an easy home test to determine what kind of soil (sand, silt, loam, clay) you have. The site explains how to create a loamy soil. 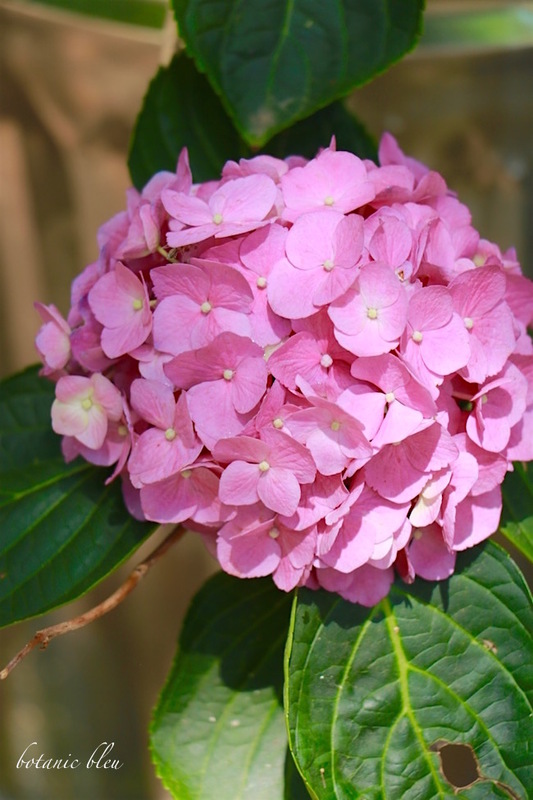 Gardener's Supply Company has a good summary for changing a hydrangea bloom's color and is a source for buying a pH-testing kit and for buying soil amendments to change the pH balance of your soil. Very informative post. I adore hydrangeas too. After growing them for years I am still learning new things. After three years moving an Endless Summer it now has pink blooms. I don't know what changed for its color to change. It struggled after the move but had blue blooms. Isn't it funny it now has pink? I like it having pink because all my others are predominately blue. I have two white but they are small. Hoping they will grow more. They were small hot house plants when I purchased them. Thanks for your visit and for this very informative post. I'm off to find some gypsom for an area I have that is clay. Thanks Judith, I love hydrangeas but the mystery of pH in south Texas has eluded me. It's very alkaline here, so not too many seen around. Looks like potting them would definitely let me control that situation. A "MUST PIN" for me! Judith, I can't tell you how timely this is for me. This weekend I'm planning to buy a hydrangea for my back yard and now, thanks to your light condition info I know what to get, where to put it and what to add (or not) to the soil. All this plus the photos are terrific. Thanks! I purchased a very pretty bouquet of blue silk hydrangeas that I absolutely love. I hate to admit defeat, but I've never had good luck growing them. Congratulations on growing some beautiful specimens, which is not an easy feat in North Texas !!! 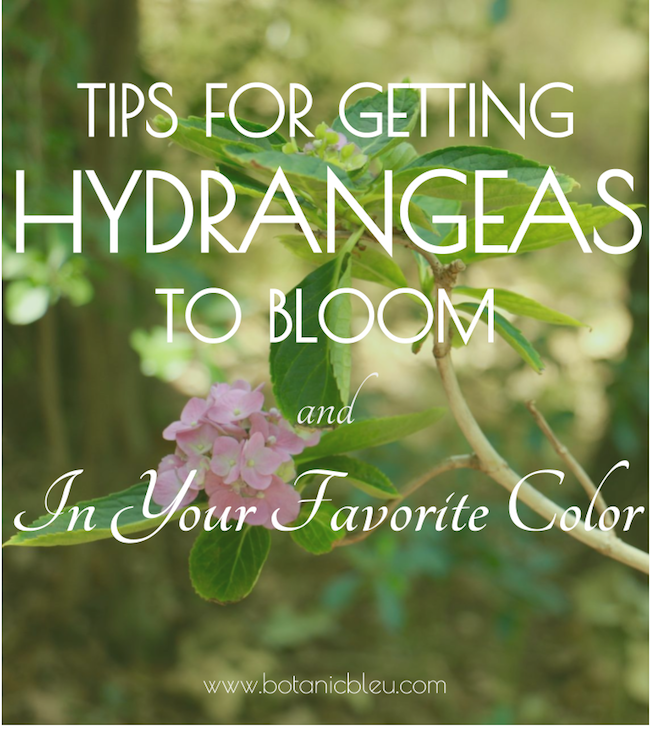 This was a very thorough post on hydrangea! Such great flowers and so beautiful in landscaping! Thanks for all the tips, I pinned it! 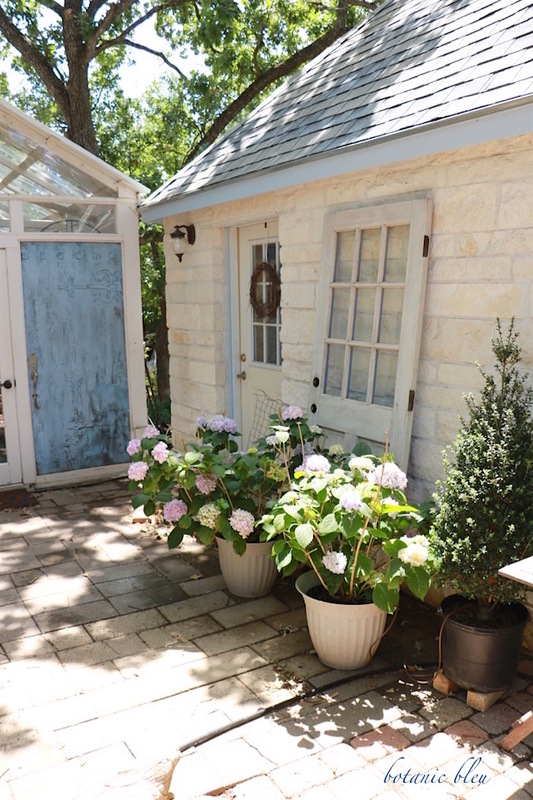 Your Endless Summer hydrangea may have changed from blue to pink after three years because the pH of the soil changed due to rain leaching it out over time or lack of natural composting materials like leaf mold falling around the new site. Maintaining a hydrangea's color often requires repeatedly adding soil amendments over time. Otherwise, the soil reverts to its natural pH. I hear you about the struggle in north Texas for growing hydrangeas. It takes a lot of work all during the year. I was encouraged to try to grow them because three of my friends grow them successfully in their yards in the same general area in which I live. My sister does most of the work caring for the hydrangeas. We both have a desire to see them grow since they came from our mother's yard, and Mother always grew lush beautiful hydrangeas in Alabama. Every year I would come home from visiting her with buckets of gorgeous blooms. Your hydrangeas are beautiful! Thank you for sharing! Thanks for the tips. Living in Florida, I'm trying for the 2nd year to get hydrangeas to grow in the ground without great success. Even in partial shade the Florida sun is a killer. Wow, now I need to go out and really take a close look at my hydrangeas. This will be their second year and I was clueless, but not anymore! Thanks! I have one hydrangea, so far. It is coming back from the "dead rack" at Lowe's (sold half-price) and is just now producing new leaf buds!!! Yeah! Will move it and all other pots around to the front of our trailer as we head into "real summer." These are lovely and I always wanted to grow them on my yard. Thank you for sharing at Dishing it and Digging it link party. Your photos and instructions are very good. I have pinned it for future reference. Most informative information I have found. I have a question on how to recognize and identify what type of hydrangea plants I have. This year I did purchase a Annabelle. So far it’s doing ok. All the other 5 or 6 plants I have hfor several years have not bloomed in several years. Forgot to mention we are in far North Texas. Almost to Red River.